Byoudoin Temple in Uji, Kyoto, is a conversion of the glorious villa owned by the Fujiwara Clan. The Amidado, commonly known as Hoo-oo-do (Fenghuang in Chinese or Phoenix in English, the mythical bird revered and meant to protect Buddha) Hall was built in 1053. It is a real wonder how the beautiful Heian Period building survived wars and fires throughout history. I was lucky enough to see wisteria in full bloom when I visited this past April. 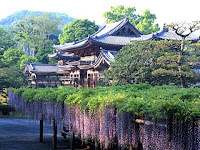 I also visited Kisshoji Temple decorated with a famous local (Kitakyushu) wisteria garden, founded by the Reverend Chinzei as his ancestral Katsuki Clan Botai temple. 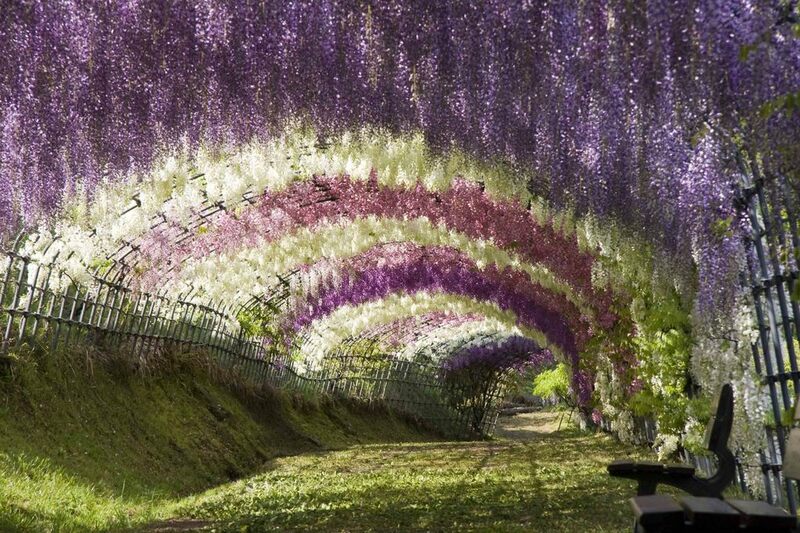 Wisteria in Japanese is Fuji. The Chinese characters for the flower Fuji is not the one used for Mt. Fuji. 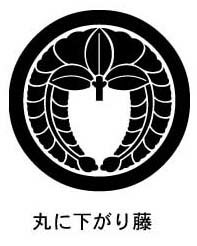 Instead, the character is the one used in the Fujiwara Clan. Yes, that's right. The family crest of Fujiwara uses wisteria as its symbol. The dominant Fujiwara names split and spread as descendents with such derivative names as Ito, Kato, Kondo, Goto, Sato, ..., etc. Bill Bryson's A Short History of Nearly Everything says Caspar Wister gained a certain unexpected immortality when the botanist Thomas Nuttall named a delightful climbing shrub after him (1818). 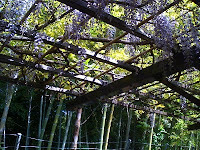 Belonging to the pea family, wisteria vines entwine around any available support, usually a trellis. Now, I’d like to offer a bit of intro to the Kabuki Play “Fuji Musume" for blog readers overseas. 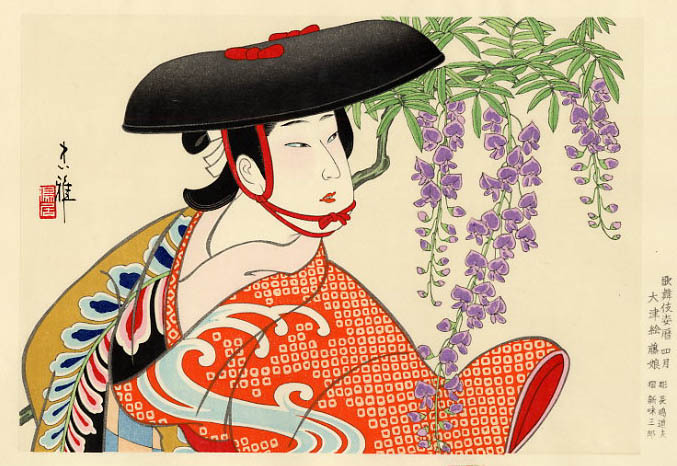 It is a visual climax of a Kabuki show, in which the dancer performing the role of a wisteria maiden. She changes her Kimonos four times and dances against the gorgeous backdrop of clusters of mauve and purple wisteria flowers, as well as giant trunk of green pine tree. 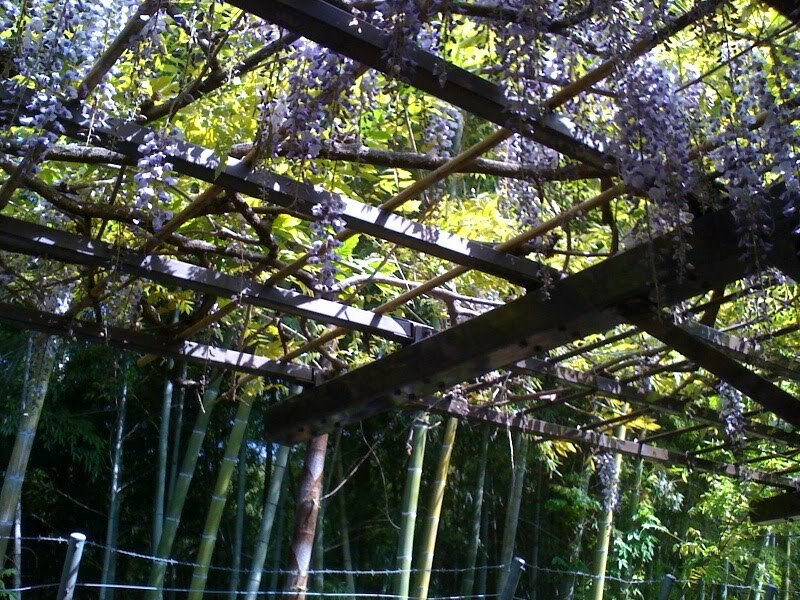 Pine stands for man, wisteria for woman. Accompanied by Nagauta chanting “Wisteria whorls colored delicately purple and extended longer”, the dancer expresses feelings and emotions related to love in the manner of the Edo period by holding a wisteria twig with her coquettish and adorable gestures, twirling around the pine tree. Eventually, sadness and despair take over the maiden. Heartbroken and drunk on Sake, she does a most beautifully frenzied and tortured dance of unrequited love.